The Fallout series is about the aftermath of a major catastrophe, and Fallout 76 seems to find new ways to define disaster with each passing week. Just days after it came to light that Bethesda had swapped the canvas bag shown in promotional materials for the $200 USD (£249.00) Power Armor Edition for a cheaper nylon version, we’ve learned that Bethesda gave free canvas bags to invitees to a Fallout 76 influencer event in the lead-up to launch. YouTubers and streamers attended a Fallout 76 event at the The Greenbrier, a real-life hotel in White Sulphur Springs, West Virginia in October to get an early look at the game. Attendees received some free Fallout swag, which included a canvas Fallout 76 rucksack, as GameRant reports. A month later, players who pre-ordered the Fallout 76 Power Armor edition were dismayed to find that the canvas carrying bag for the T-51b power armor helmet shown in the advertising materials for the edition had been replaced with a shoddier nylon version. Bethesda has since apologized for the swap and offered $5 (£4) worth of premium in-game currency. Two things should be noted on this story of bags, however. First, the influencers who attended the event at The Greenbrier had no way of knowing that Bethesda was going to swap the bags advertised in the Power Armor edition, and it’s pretty standard for goodies to be handed out at events like this. 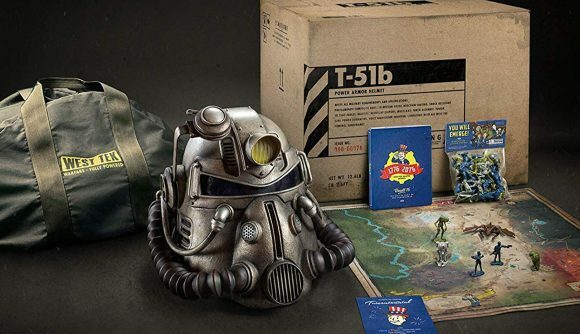 Second, the bag they received at the event is obviously different from the one depicted in promotional material for the Power Armor edition – so they weren’t getting bags that had been promised to players who had pre-ordered it. Still, it’s another piece of bad news for a game that’s been a bit of a bomb since it launched.